Football Focus is behind the scenes at non league Lincoln City for FA Cup 4th round weekend. Dan Walker is joined by Graeme Le Saux and Dion Dublin. Browse content similar to FA Cup Fourth Round Special. Check below for episodes and series from the same categories and more! Oh, it's absolutely brilliant. Oh, this is getting better and better! to be an historic night, it's going to be. born in Lincoln Town in hospital tonight, I hope it's called Lincoln! they love you. Somebody has to. You can tell it's a big week, Honey G is performing. We missed out then! We are focussing on Lincoln but Lincoln and Sutton. Two non-league sides for the Cup. It is fantastic. often say but speak to the fans, they think they have a real chance. it, why not. It is a fantastic opportunity. Devlin. How old are you, deaf Lynne? Four years old. maths question. What do you think that the score will be? 1-0. To Lincoln? Yeah! Well, that is worth a round of applause. Owen, what about you? I'm eight years old! And the score? 1-0. Football Focus! This is what is coming up on Football Focus. Arsenal's trip to Southampton. Four games on Sunday. that four or five seconds. It's mad feeling. goal developed or came about? I think so. City goal. We were both fighting for the title. alone as Manchester United record goal-scorer. That's a really impressive record to achieve. Obviously a great moment for myself. A proud moment to get the record. room after the game and congratulated me. That meant a lot. congratulations. It was a special moment. What do your kids say? I have been speaking to them. They understand. They were made up. I have to re-enact it. doing is trying to find the right one, I believe they've found him. up with the successes around the corner. to stop you scoring goals at every single game it is a huge game. well. What about a future in management? and the pulls, and he has gotten through them. and legal. But everything is going their way. watching analysis? Yes, the last bit of Brighton. and it's been crazy for us. And from a boss perspective, Daniel? It's been magic. The magic of the FA Cup has certainly landed in Lincoln. has allowed us to connect with the city and the people. between us and the supporters as I think we have similar traits. Barrow? You lost against Barrow? Yeah. the smiles on their faces! Guys, I really appreciate you talking to us. Liverpool. Managed to make it back pitch side! they perform at the highest levels and they do individual brilliance. 10:30pm. It is Gabby Logan with Trevor Sinclair and Danny Murphy. Mark Clemmitt has been out with the bus. years ago... 47 years ago, 1970! All good ingredients. There you are! amazing. It would surpass the feeling... It would be incredible. you are probably the best-known player in the lower two divisions. Social media has played a massive part and I think it bridges the gap. joy when you came out of perhaps to go to Tottenham. -- out of the hat. football for. For myself, I'm going to try enjoy every minute. if I score or if we win, you will be seeing these moves on Saturday. That's worth watching the highlights programme! Just for that! Thank you. afternoon, everyone. Are you all right? I was in the wrong position! I nearly got sold down the leagues! at Pride Park tonight. In the end it's an awful own goal. Darren Bent can't believe it. Craig Bryson to give them the lead! Gray! the equaliser from Morgan. Leicester and Derby must do it all again. are a goal up. We said it would be a day where Wolves would go for it. game plan is to try to stop the space behind them. ban. Do you think he got off lightly with this? Not having a stadium ban? that players and managers know you cannot man handle officials. is not on the touch line. They will! Some players like to get on with it. context. I think it is right. that is key. So that support that the players have now is fantastic. if a player stays down and doesn't move, there is something wrong. We do wish Ryan Mason all the best and hope he makes a full recovery. the morale is a key issue -- Livermore. The atmosphere in the dressing room will be important. the game time. I went to Swansea, since then it has been up an down. You come back off loan, then packing another case and shooting off again. are getting better at it with the likes of Loftus-Cheek. Chelsea. They are back to win it 4-2.
going to happen. I know it will be tough. I'm looking forward to it. The Chelsea fans are excited to see me back there playing. springboard. He is still only 21. It is young. And Chelsea, they are so formidable, especially at home. They are wiping the floor with everybody. So many good players. following weekend, it could be a decisive week in the title race? Yes. Chelsea have the system, the 3-4-3. Every player knows his role. about football, and I'm a huge fan is this: You are never on your own. down on. Say stop anywhere. Stop. are putting our magician, our assistant inside the little canon. on it. All of the rest. Absolutely nothing. Show the camera. Can I have a round of applause! I need some explanation of that trick. it as it comes but it is not a normal game, nor a normal build-up. to embrace. Hopefully we'll get a result. from your team-mates? Who will give you the opportunity? The wingers. to be successful. That is great. We have a good opportunity this year. They won't leave a stone unturned to bring success to the team. wave of his forgot the name wrong. Obviously, Bradley had a good game. and the FA Cup, my mind drifts back to 2004 and the Millennium Stadium. special achievement. To surpass someone of his stature was huge. achievement, being the record goal-scorer at a club, is huge. we are talking about really good pros. Really good senior players. when I woke up and read that you were suffering from cancer. completely separate from Sunday's game. It is a tough game for us. side. Had to quit plaintively scored. So we have that mentality. Premier league side who may be in for not the best weekend. any memories of your time at Millwall? On live television, no! 11:50am. That is followed by Manchester United versus Wigan. season, and we are enjoying a great season and it should be a cup tie. this with some guys and we don't get anything for being first in January. manager behind the team. Do you feel you need anything else to click on? bit of luck and I think last year we lacked a bit of luck at key times. star. See you all again! Bye-bye for now. That is an absolute present. What a fantastic track from Aaron Ramsey. Football Focus is behind the scenes at non league Lincoln City for FA Cup 4th round weekend. Dan Walker is joined by Graeme Le Saux and Dion Dublin. 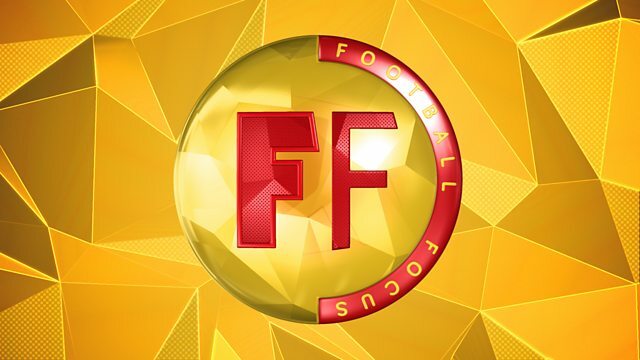 Interviews include Manchester United's record goal scorer Wayne Rooney, Wycombe striker Adebayo Akinfenwa - who's hoping to knock out Premier League Tottenham. Plus a feature at Sutton, who are the lowest ranked team left in the competition.